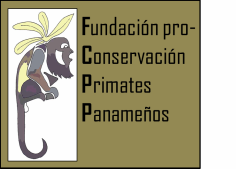 It is a Panamanian non-profit organization that is initiating the first population counts of non-human Primates of Panama, in order to understanding its population ecology and to serve of base for studies of environmental impact for the benefit of the flora and fauna of our country. We survey primate populations in Panamanian forest reserves and fragmented forest, specially those subspecies less studied or critically endangered based in the IUCN list. Additional, we keep monitoring year by year each area surveyed to obtain scientific information about their ecology and conservation status in the wild. Attached to the surveys activities, we also visit the local communities and schools to give them information related with primates and another fauna, helping them to protect themselves their environment. We consider our country as an important point of natural resources and we carry on our job with the unique objective of contribute in an honest manner, our knowledge as biologists with the philosophy of “Live and let to live”. In this way, we are conscientious that even being Panama a developing country, we should work for the best way to manage our own resources without let the human being to lead the extinction of the surrounded nature. We are convinced that the necessary education and collaboration of all the visitors and Panamanians, we together can some day to keep a feedback system where woman, man and nature could benefit mutually. 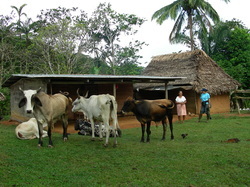 More than prohibitive laws, punishment and persecution, or as well taking lands, it is preferred to offer ideas that improve and face the real problems that the country persons usually live day to day, this only is possible knowing and respecting their traditions, culture, their naturalness and the actual situation of their species that surround them. The FCPP born due to the intention to expand an initial population project where we survey primates’ groups that are living in fragmented forest on the Azuero Peninsula. 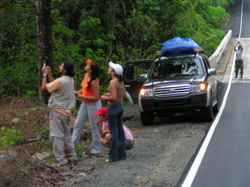 The “Pro-Conservation Project for the Azuero Endemic Primates”, started in April 2001 by Pedro Méndez-Carvajal, a Panamanian biologist from the University of Panama. This project was created to obtain an idea about how many monkeys are still remaining in the wild out to the reserves and National Parks in Azuero Peninsula. Into the list of species that we have studied we can mention the Azuero spider monkey (Ateles geoffroyi azuerensis) and the Azuero howler monkey (Alouatta coibensis trabeata), both surviving in living fences and remnant forests at Azuero region. The studies include primates surveys, vocalization, behavior, and have been added an environmental education project for the Azuero region. We visit primary and secondary schools, and communities where we have offered conservation talks related to the environment and the protection of their fauna, specifically of the non-human primates.